Korean firm LG Electronics has said it has reached a deal with search engine Google to let customers access the site from its mobile phones. LG said it would enable customers "easy access to their favourite internet services even without a PC". LG - the world's fifth-biggest mobile phone firm - will ship handsets with Google services from April. The deal comes after Samsung Electronics established a similar tie-up with Google earlier in the year. Search engines have been trying to sign deals with both content providers and networks, to tap into the booming market for content that can be reached via a mobile phone. Among the services LG will make available are Google Maps, Blogger Mobile and Gmail. 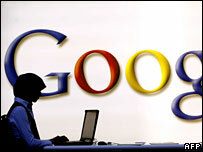 The firm is also planning to develop 10 new models of handsets that will be able to access Google's services. LG says users will be able to access Google via a one-click icon on their handsets. Earlier in the week Google launched its mobile search engine, while rival Yahoo has been improving its "oneSearch" mobile search engine to make it more personalised for users. Yahoo said that its Mobile Publisher Services would help publishers to distribute their content on mobile phones.